I met many fascinating and brilliant people at the recent Consortium of Multiple Sclerosis Center’s annual meeting, including those I met in the exhibit hall. One such person manning (or is it “womaning”) a booth was Mindy Eisenberg, yoga therapist, author and a woman who dedicates her life to helping people with multiple sclerosis. After watching her mother battle a downward spiral with the disease she knew she had to do something to help others. This is my post about Mindy and her incredible book. The physical benefits of yoga for people living with multiple sclerosis are many. They include increased flexibility and muscle strength, improved energy and vitality, maintaining a balanced metabolism, weight reduction, cardio health and protection from injury. It’s also about breathwork, meditation, stretching and mindfulness, all things we should work on including in our lives to live the best one possible despite chronic disease. That’s why I’m thrilled to introduce you to a book I found that helps bring adaptive yoga right into your home. I was excited to find it for myself and now I’d like to share it with you. 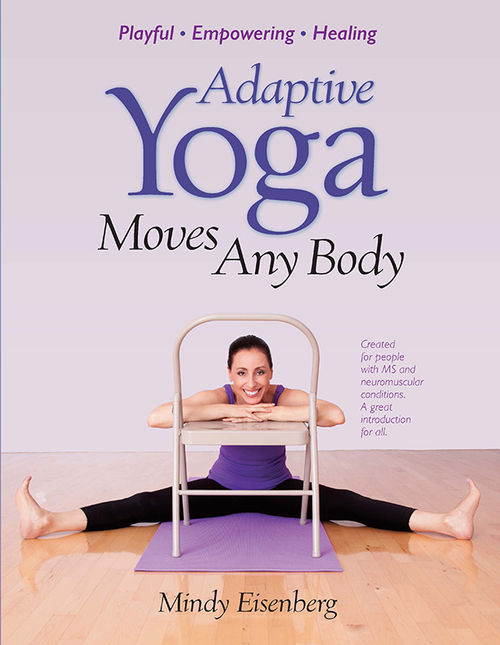 The name of the book is Adaptive Yoga Moves Any Body and its author, Mindy Eisenberg, has been teaching yoga to students with MS and other neuromuscular conditions for 11 years. And with amazing results. I met Mindy at the recent Consortium of Multiple Sclerosis Centers annual meeting where she had a busy exhibit hall booth. It took me two days to finally catch up with her! When I did I soon realized that if I lived in Michigan she’d definitely be my new BFF. I loved her overwhelming passion to help anyone living with MS. Her growing Yoga Moves community is something she created for us. Having a conversation with Mindy was inspiring. For anyone unfamiliar with adaptive yoga here’s my explanation of it. When my son was young I’d drive him to grade school (fifteen minutes from our home) and then, once a week, head to yoga class. It was an intermediate class and I was able to keep up with fellow students. Today my MS has given me a few added challenges. Practicing adaptive yoga fits the bill, with my instructor tweaking my practice to suit my new needs. “What is Adaptive Yoga? Those with movement challenges require a more creative approach to traditional postures. Over the years I’ve looked for a book that would allow me to practice yoga at home on the days there was no class. I searched and searched and came up empty. Enter Mindy’s book and BAM! When I opened it I felt like I was welcoming a yoga instructor and fellow students into my home. As you leaf through the book there’s page after page of helpful photographs of people (all Mindy’s students – isn’t that wonderful?) demonstrating a specific pose, along with explanations of the pose’s primary benefits, any precautions, and a list of props to have on hand. There are adaptations and variations on poses, as well as thoughtful quotes from Mindy’s students. All of this rounds out the feeling that you’re in the right place. At the back of the book are lists, with photos, of any specific move you may be looking for. For example, there’s a page of poses for “Computer Break Sequence” (don’t we all need that?) with fifteen different poses listed underneath and where you can find them in the book. On the righthand side of the page is an outline of Energetic Qualities,Time Estimates and Props. There are four pages of definitions in case you have any questions, and two pages of useful resources for organizations along with suggested readings and recordings. I was so bowled over by the beauty of this book that I began reading it on the plane ride home. It helped me feel that I can feel good about myself despite my diagnosis, that I can be part of not only the yoga movement but also become part of a large (loving) community. “Very simply, my Yoga Moves students asked me to write a guide for them. They enjoyed how they felt during and after completing a class, and wanted to continue their practice at home. Experience showed them that the benefits of yoga dramatically increased with more frequent practice. They needed a way to remember the poses and techniques and asked me for a few photos with accompanying instructions. Can you tell how much I love this book! It feels like I finally found something (and someone) to help me reach my wellness goals. Now I can do my yoga routine in the comfort of my home knowing that I have a safe place to fall, in the arms of a book and a community.